Using the CAP to promote a climate-friendly agriculture in Europe (or, as it is increasingly called, a climate–smart agriculture) was one of the stated objectives of the Commission in putting forward its CAP reform proposals in 2011. Agriculture both has a mitigation role to play in climate policy, and must also adapt to climate change. Regarding mitigation, the Europe 2020 Strategy establishes the reduction of greenhouse gases as one of the EU’s five headline targets. Agriculture is both an emitter and a sink of greenhouse gases, and agricultural soils contain a large stock of terrestrial carbon in the form of soil organic matter. Agriculture can also play a role as a supplier of renewable energy whether in the form of biomass or biofuels, although there is controversy over how far to push this role in view of the additional competition for land that results for food production. The modelling assessment made in the EU low carbon economy roadmap, based on the current CAP, concluded that the EU agricultural sector could decrease its GHG emissions by between 36 and 37% by 2030 and 42 and 49% by 2050 depending on the decarbonisation scenarios used. Recently, Teagasc, the Irish agricultural research and development organisation, published an interesting analysis of what it would take to make Irish agriculture carbon-neutral by 2050. However, regardless of its mitigation contribution, agriculture will have to adapt to a changing climate, which will mean shifts in the location of agricultural production and also changes in management practices on individual farms. What shifts are we likely to see? How important will they be for production and farm income in Europe? 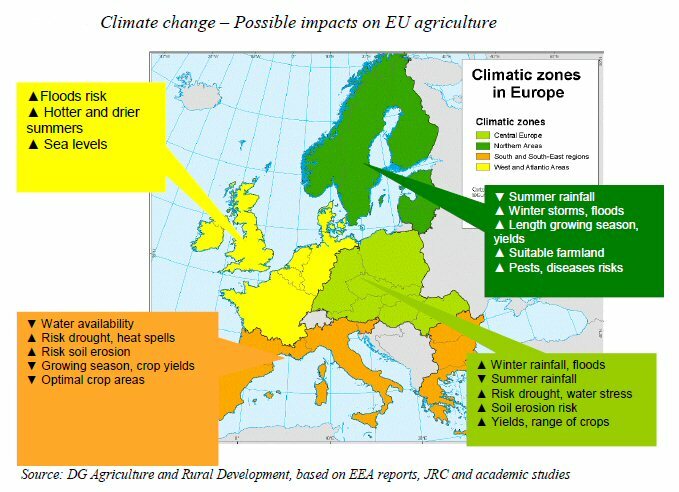 Previous studies suggest that these effects are likely to be regionally differentiated; climate change could have positive effects in northern Europe through introduction of new crop varieties, longer growing periods and expansion of suitable areas for crop production. In southern regions, negative effects are likely to predominate because of reduced water availability and greater incidence of extreme weather events. A new modelling analysis of these issues has recently been published by Shailesh Shrestha, Pavel Ciaian, Mihaly Himics and Benjamin Van Doorsaleer. They use the well-known CAPRI model maintained by the University of Bonn to explore the impacts of climate change on EU agriculture. Their results may be surprising to many, and I will describe them later. But reading their work also gives an insight into the complexity of modelling the impact of climate change on European agriculture and the wide range of uncertainty surrounding any results. There are three steps in evaluating the impact of climate change on European agriculture. Projecting changes in weather variables such as temperature and rainfall using climate models. Already here the uncertainties begin. There are different climate scenarios (that is, assumptions about the build-up of carbon dioxide and other greenhouse gases in the atmosphere) as well as differing interpretations in climate models of the mechanisms at work in determining climate. The Shrestha et al. study uses the A1B emission climate scenario specified by the IPCC as realised by two different climate models (this Wikipedia entry has a discussion of the different emission scenarios used by the IPCC). The Hadley Centre model projects a more than 3°C increase in average European temperature in 2020 compared to the year 2000 (the ‘warm’ scenario), while the Max Planck Institute for Meteorology’s ECHAM model projects a more modest 1°C increase (the ‘mild’ scenario). These are very rapid temperature changes; even the mild scenario implies a warming of 0.5°C per decade which is outside the range described by the climate modelling results available to the IPCC’s Third Assessment Report. Those results showed an increase in annual temperature in Europe of 0.1 to 0.4°C/decade over the 21st century based on a range of scenarios and models (see Alcamo et al IPCC Europe study). There is also a substantial difference in the rainfall projections from the two models. The warm scenario shows a much stronger increase in rainfall south of the Alps and in Spain relative to 2000 (up to a doubling of rainfall) while in the mild scenario the Iberian peninsula and most of Western Europe gets drier summers but France and Scandinavia would see an increase in precipitation. Particularly the rainfall projections for the warm scenario seem at variance with the conclusions of the Alcamo et al. IPCC report. Differences between models also occur not only in the absolute amounts of rainfall projected but also in its distribution throughout the growing season. Translating changes in temperature and rainfall into crop and grass yields using biophysical models. These models provide detailed simulations of the crop growth process and how this is affected by differences in temperature, water availability and atmospheric gases such as ozone and carbon dioxide concentrations in the atmosphere. Elevated CO2 in the atmosphere is projected to lead to an increase in the yields of some crops, although again the magnitude of this ‘fertilisation’ effect is disputed. The anticipated yield changes will also be affected by whether existing management practices are assumed to continue (‘no-adaptation’) or whether farmers are assumed to optimise yields under the new climate conditions, for example, through adjustments to the crop growth cycle length, crop sowing date and use of supplemental water (irrigation) (‘best-adaptation’). The Shrestha et al. paper uses the BIOMA biophysical modelling platform to make these yield projections. Estimating the land use, production and income impacts due to the changes in yields. The yield changes projected from the biophysical models alter the relative profitability of different crops and livestock. The anticipated changes in land use and production must then be estimated using supply models of EU agriculture. The supply models can be estimated assuming constant prices, or can be linked to a market model in which market prices are allowed to adjust to a new equilibrium. The Shrestha et al. paper uses the CAPRI supply and market modules to make these calculations. The CAPRI market model is a global model so supply and demand responses in the rest of the world as well as in the EU27 are taken into account. Results are presented in their paper both for fixed prices and allowing the market module to determine new equilibrium prices. The strength of the CAPRI modelling system is that results are provided at the NUTS2 level, so it is highly regionally differentiated. For presentation purposes, regions are aggregated into five zones – Northern Europe, Southern Europe, Central Europe North, Central Europe South and British Isles. Results are also presented for eight climate scenarios (two climate model outcomes (warm and mild), two adaptation scenarios (no-adaptation and best-adaptation) and with and without market price adjustment, which together give rise to eight possible combinations. The results show that yield changes, assuming no adaptation, vary between -37% and 20% depending on scenario and crop. With optimal adaptation, yield changes improve significantly and are all positive for the EU as a whole, varying between 4% and 62% depending on scenario and crop. Weighted average changes in the warmer scenario tend to be higher than in the mild scenario due to more favourable changes in temperature and rainfall in the former scenario. When these yield changes are fed into the economic models, climate change is shown to have a positive impact on agricultural production due to the higher yields but with strong differences in adjustment patterns between sectors. Cereal production is projected to increase within a range of 3% to 17% under all no-adaptation scenarios. Both cereal and oilseed production increases by between 25% and 35% under the best-adaptation scenarios. Cereal production falls in Spain under the mild climate change scenario but, surprisingly, it is shown to increase under the hotter climate scenario because of the higher projected rainfall levels in that scenario. Prices fall in the market adjustment scenarios, and fall by more in the best-adaptation scenarios because of the greater stimulus to production. Animal production (milk and beef) is also assumed to increase both because of cheaper feed supplies (due to lower crop prices) as well as the higher yield level of feed crops such as grassland. No direct effect of climate change on animal productivity is assumed within the relatively short time period of the projections. Overall, there is a (small) general improvement in economic welfare due to lower prices for consumers. Farm incomes would increase in the constant-price scenarios, but show a (small) fall in the scenarios where market prices are allowed to adjust. As always, the results come with a number of caveats. The BIOMA crop production modelling platform provides yield data for just four crops: wheat, rapeseed, sunflower and maize. Yield changes for other crops are assumed similar or the aggregated change in yields for the BIOMA crops is assumed. The aggregate crop yield change is also assumed to apply to grass yield. Yield changes are compared to a baseline yield in 2020 projected forward assuming no climate change effects. Although some technical adaptation is included in the biophysical models in terms of growth cycle length, sowing date and water availability, the study does not account for other types of adaptation such as the introduction of more appropriate crop varieties or altered management practices. Thus, even though the ‘best-adaptation’ scenario assumes that all farmers fully optimise their inputs under current management practices which may be an unrealistic assumption, it may nonetheless prove conservative as an estimate of the totality of adaptation changes that farmers may adopt. Working in the opposite direction, climate change may bring new challenges in terms of pests and diseases that are not incorporated into the analysis. A significant limitation is that the impact of climate change on agricultural production in the rest of the world cannot be taken into account. If global agricultural production outside the EU is negatively affected by climate change, then global prices would be higher than projected in the paper and EU production and farm income would be even higher than projected in this paper’s results. Finally, the climate change impacts are limited to the impact of temperature and rainfall changes on yields. Other potential impacts, such as possible changes in hydrological cycles due to loss of snow and ice in the Alps, increased flooding, disruption to biodiversity and the impact of sea level rise on coastal areas, are not taken into account. Also, the study has a relatively short time horizon to 2020. Studies which take a longer time horizon generally show less favourable results for production impacts. The finding that EU agricultural production is likely to be higher for most crops and in most regions at least in the immediate future as a result of climate change will be welcome news although of course EU climate policy cannot be dictated by the interests of one sector alone, and the study does not attempt to project the longer-term consequences in the decades beyond 2020. It is important to underline again the complexity of analyses of this type and the extent to which results are influenced by the range of assumptions used. The yield impacts are consistent with but higher than those estimated in this JRC PESETA study (the latter study includes a 2030 scenario that has similarities with the Shrestha et al. paper. However, it puts more emphasis on the 2080 time horizon when productivity gains are considerably smaller and losses greater in the respective regions). From a policy perspective, the paper underlines the importance of successful adaptation in coping with climate change. Thus, a key focus of policy must be supporting farmers in understanding and implementing the necessary technical adaptations and in developing appropriate innovations. The paper points out that targeted measures at regional level are likely to be more useful than uniform measures at the EU level given that regions are differently affected by climate change. From this perspective, the principal climate measure introduced in the 2013 CAP reform, namely, the restriction on the conversion of permanent grassland to arable cropping, seems singularly inappropriate. The results in the Shrestha et al. paper show that, under the ‘no-adaptation’ scenarios, there would be little change in the ratio of pasture to arable land except under the warmer climate change scenario which favours arable crops. Under the ‘best-adaptation’ scenarios, however, there is a clear switch in land use from pasture to arable crops for the EU27 as a whole. This partly reflects the greater profitability of arable farming but also the assumed greater productivity of grass, which allows the livestock sector to satisfy its feed needs from less pasture land leading to a decline in pasture land in the EU. The justification for maintaining the ratio of permanent pasture to arable cropping in the revised CAP regulations is its apparent potential role in mitigation, to avoid the one-time release of CO2 from the soil due to ploughing and to take advantage of the greater capacity of grassland to sequester soil carbon. It is generally agreed that limiting the conversion of grassland to arable land helps to maintain soil carbon. However, just looking at soil carbon alone fails to take into account subsequent emissions from the way the land is used. If annual emissions from cattle farming on pastureland are compared with emissions from conservation tillage on arable land for typical soil types and stocking densities in Europe, do the excess emissions in terms of methane fluxes from cattle farming over a reasonable time period (say, 20 years) compensate for the carbon debt accrued when the land is first converted? I don’t know the answer, but the case that they do not has not been convincingly made in any of the supporting documentation. Converting arable land to pasture (or conversely, preventing the conversion of pasture land to arable) was not one of the mitigation options considered in the IPCC Fourth Assessment Report. Nor is there any discussion of the presumed mitigation advantages in the Commission’s impact assessment of its CAP 2013 proposals, although the potential costs by impeding the shift to a more profitable production system are recognised. I find it strange that farmers all over Europe are prevented from converting grassland to arable land for a very ill-defined rationale when it seems clear this could be a sensible adaptation to climate change in many regions (the requirement is not a novel one as it is already part of cross-compliance requirements for eligibility for the single farm payment). To be absolutely clear, I am not referring to converting carbon-rich or high nature value grasslands where the arguments for protection are much clearer than for much intensively-farmed grassland. There is also the bigger question whether the meat-intensive diets that raise the profitability of arable farming, given the high proportion that now goes for animal feed, are desirable in the longer run. But this is a question of influencing consumer demand and diets and is not something which can be tackled by regulation of supply. By fixing the ratio of permanent grassland in the total agricultural area, it seems we have reintroduced supply management regulation into the CAP through the back door at the same time as we are removing it through the front door in the dairy and sugar sectors. Is this a sensible approach? Very interesting article. It will be vital to ensure that the EU agricultural sector mitigates emissions limit climate change to 2 degrees. You mention that climate scenarios only include temperature and rainfall and do not include the impact of increasing extreme weather events like floods. It seems to be a big omission as surely agriculture will be hugely affected by flooding. I have a question about the article. Am I right in thinking that the “permanent grassland” under the greening measure can be used for pasture? Sorry if I had misunderstood this point. A major portion of the agricultural sectors impact on climate change is from the livestock sector and methane emissions. If the new measures lead to increase in keeping of livestock then surely there will be an increase in emissions? I look forward to your response. As a follow-up, I found the definitions on page 24 of the legal proposal for the direct payments, document COM(2011) 625 final/2. It states that permanent grassland “may include other species suitable for grazing provided that the grasses and other herbaceous forage remain predominant”. Calling it a “greening” provision is misleading. It seems to promote pasture and livestock-keeping. But keeping livestock contributes massively to emissions. An FAO report from 2006 called ‘Livestock’s Long Shadow’ estimated that livestock contributed 18% of greenhouse gases, the same as transport. I feel that this undermines the environmental integrity of the reforms. What do you think? Thank you for this response. In studies attempting to assess the impact of climate change across Europe as a whole, some simplification is inevitable and not all impacts can be taken into account. One of the problems, as I understand it, is that the current spatial resolution of the main general circulation models (climate models) may be too coarse to be able to say anything very specific on the impacts of flooding, and it may make more sense to look at these issues at a more local e.g. river basin, scale. In the new direct payments regulation, the term ‘permanent grassland’ is defined to mean both permanent grassland and permanent pasture. It excludes grassland included as part of a crop rotation within the previous five years. Indeed, your last point goes to the heart of the question I wanted to raise. Maintaining permanent grassland is justified on the grounds of carbon sequestration, but as you point out the measure is also likely to lead to higher livestock numbers with associated methane emissions. While the balance between these effects will differ across different soil types, different livestock stocking densities and management systems and different crop management practices, so it is unrealistic to expect a black and white answer, the available documentation does not reference any study which shows the mitigation advantages of maintaining permanent grassland if a more holistic perspective is taken. I am hoping that some reader may be able to point to some relevant studies. In the context of Irish agriculture it makes sense to at least maintain our grasslands. The fact that our climate (current and predicted) is both suited to growing and most importantly grazing grass over a long season, means that we are ideally placed to produce animal products, especially milk. If Ireland was to substantially convert to arable, then these animal products would need to be produced in a less carbon efficient and water efficient manner. Thanks for this response. The projections for the impact of climate change on Ireland seem to suggest warmer and drier summers, and wetter winters. Whether on balance this will favour grass growth or crop yields more I do not know. But my point would be that, in the absence of a compelling carbon mitigation argument, we should leave it to individual farmers to decide how best to manage their farms in the light of the weather conditions they find themselves in in the future. If it turns out there is a net carbon gain from maintaining grassland (when measured in the holistic sense I define above), then it would still be better to recognise this through a direct subvention to grassland farmers related to the carbon they sequester, rather than a rigid rule which applies de facto to every farm across the EU. I recognise that the technology to do this reliably and cheaply at a farm level does not yet exist, but there is a lot of research going on in this area.. Previous PostPrevious Does national spending on agriculture follow a different path to the CAP?